Upon arrival at Srinagar airport, you will received by our representative and you would be transferred to your hotel or houseboat where you will proceed for check-in. Afternoon visit important sights of Srinagar City-Shankaracharya Temple and Mughal Gardens(Nishat Bagh and Shalimar Bagh). Overnight stay at the hotel. Afternoon drive back from Pahalgam to Srinagar. After having breakfast in the hotel, In the morning, you will be driven for full day excursion trip to Sonamarg. Sonamarg (Meadow of Gold) – It is a place of enthralling beauty, lies in Sindh Valley, streamed with flowers, surrounded by mountains and perched at an altitude of 2690 m above sea level. Visited less frequently by tourists, it has as its backdrop, snowy mountains against a clear sky. It is a quiet alpine retreat surrounded with sycamore, silver birch, fir and pine trees and the last halt on the Kashmir side for the drive from Srinagar to Leh. It is also the base for some interesting treks to the high altitude of Himalayan Lakes. After having your lunch at local restaurant, feed your cameras with the picture of magnificent view of mountains. You can enjoy Horse ride at Sonamarg(Optional). Afternoon drive back from Sonamarg to Srinagar. Overnight stay at the houseboat. Morning proceed for a picturesque drive to Gulmarg. Gulmarg (Meadow of Gold) – It was discovered as a tourist destination by the British in the 19th century. 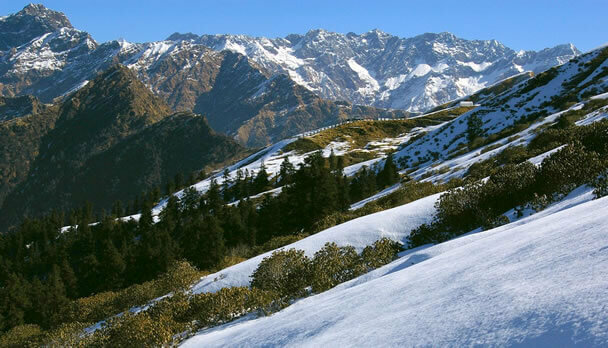 Prior to that, Mughal emperors vacationed in the Gulmarg valley which is about 03 kms long and up-to 01 km wide. For a fun-filled ride of a most unusual kind, Gulmarg’s newly constructed gondola lift from high above Gulmarg, through pine-clad slopes is exhilarating. From Gulmarg a pony track leads upwards to Khilanmarg, Kangdori and seven springs, a couple of hours by pony longer on foot. Afternoon drive back from Gulmarg to Srinagar. Morning enjoy a relaxing Shikara ride(Optional) on the lake – Its one of the most soothing and relaxing aspects of a holiday in Kashmir, later you will be transferred to Srinagar airport in time to board flight to back home.